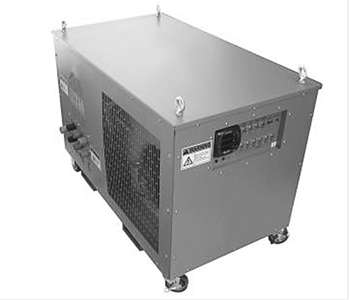 Argus distributes a range of portable resistive load banks. These load banks are smaller and lighter than others on the market and are built for durability. Easy to use operator panel with the latest in digital metering with real-time data logging capabilities and status indicating lights. An integrally mounted blower and motor with belt drive provides the necessary cooling air for the resistor load elements. Motor is rated for operation at 400 VAC, 3-phase, 50 Hz. Fast acting branch circuit fuse protection on all three phases of all load steps. Transformer has fused primary 230V, and secondary 115V control circuit. Blower motor circuit is protected by current overload protection. Operator warning and caution statements are located on appropriate access panels and doors. ‍Rated for continuous generator test operation. Argus distributes a range of portable and easy to use resistive load banks. Smaller and lighter than others on the market, these load banks are built for durability.